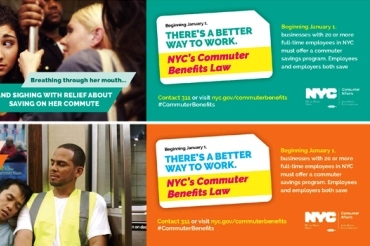 NYC’s Commuter Benefits Law takes effect January 1, 2016. Department of Consumer Affairs enforces the law and coordinates the City’s public education and outreach campaign to help employers and employees know their responsibilities and rights. January 1, 2016: NYC’s Commuter Benefits Law takes effect: Beginning January 1, for-profit and nonprofit employers with 20 or more full-time non-union employees in New York City must offer their full-time employees the opportunity to use pre-tax income to pay for their commute. Under federal tax law, employees can currently deduct up to $130 a month from pre-tax income to pay for qualified transportation. July 1, 2016: DCA will be authorized to issue violations to businesses that do not comply with the law: The law gives employers a six-month grace period—from January 1 to July 1—to begin offering a commuter benefits program. Employers will not be subject to penalties for violations that take place before July 1. The law also gives employers 90 days to cure (correct) a violation before DCA is authorized to seek penalties.